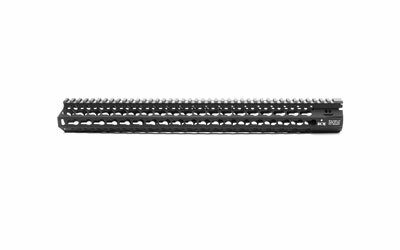 Bravo Company Gunfighter Alpha KMR Keymod Handguard 17"
Home > AR-15 Parts > Rails and Handguards > Bravo Company Gunfighter Alpha KMR Keymod Handguard 17"
Bravo Companys KMR Alpha KeyMod Handguard is a 17" long free floating handguard with all the advantages of the original KMR but now made of 100% aluminum making it incredibly lightweight yet strong. The KeyMod system was designed to work in parallel with the current picatinny system but allows for modular accessories to mount directly to the Keymod resulting in a lighter and less bulky weapon system. The Keymod system allows a larger range of modularity offering 4 different offset mounting positions between traditional the 3,6,9, and 12:00 positions. Includes a Nylon Picatinny Rail section and a BCM KeyMod Sling Mount. 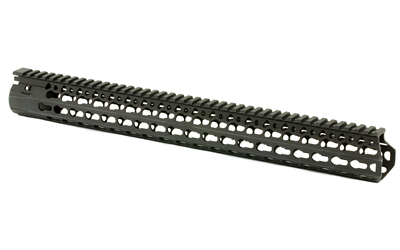 Outside Diameter (flat to flat): 1.5"
Bravo Company Gunfighter Alpha KMR Keymod Handguard 10"
Bravo Company Gunfighter Alpha KMR Keymod Handguard 13"
Bravo Company Gunfighter Alpha KMR Keymod Handguard 15"
Bravo Company Gunfighter Alpha KMR Keymod Handguard 7"
Bravo Company Gunfighter Alpha KMR Keymod Handguard 9"